Get a great price on the GeekVape Blitzen RTA from Vapor DNA. GeekVape is one of the oldest and most respected atomizer manufacturers in the business, so when they decide to market one of their creations as “the ultimate RTA” people tend to take notice. 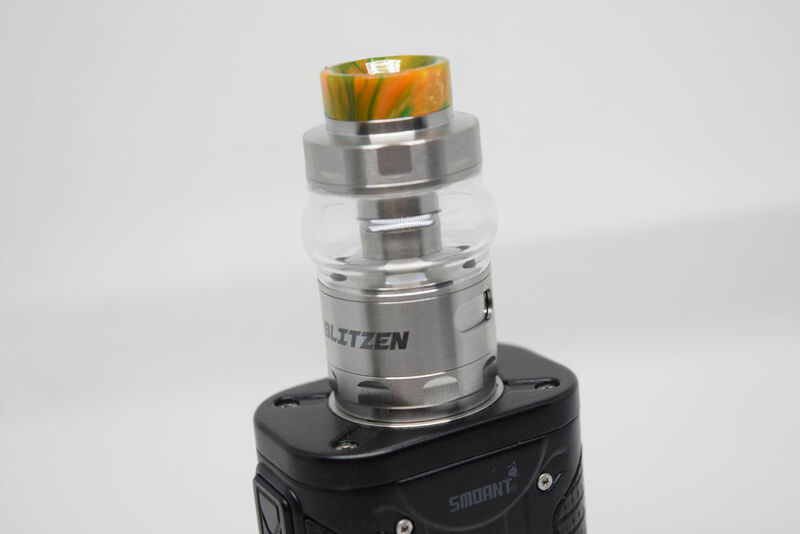 The GeekVape Blitzen is a 24mm RTA that’s supposed to strike the perfect balance between great vapor production and excellent vapor, while at the same time making leaking a non-issue by relying solely on side-airflow slots. Sounds impressive, but let’s see if the Blitzen actually delivers. The Blitzen RTA comes in the usual GeekVape packaging, a square plastic box with a clear lid offering a clear view of the atomizer and spare glass tube. Next to the Blitzen we also have the classic GeekVape goodie drawer, a small cardboard box full of spare parts and accessories. This kit contains the most impressive collection of spare o-rings that I have ever seen. They come in different colors and sizes allowing you to customize the look of the tank and even match the o-rings with a colored drip-tip. But you also get an extra 810 drip tip, an 810 to 510 drip tip adapter and a Delrin drip tip, a third glass tube for the tank – this one a bubble style tube that increases juice capacity from 2ml to 5 ml – an extension adapter for the bubble tank, an Allen key, four spare grub screws for the build deck and a metal tool for unscrewing the top fill ports from the glass section. 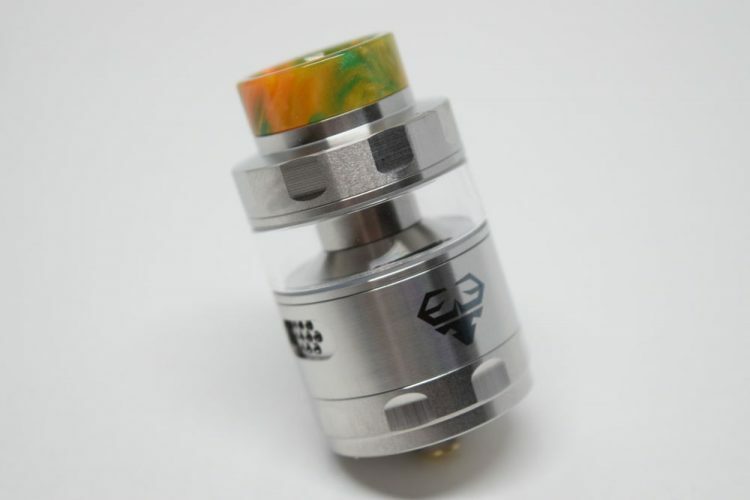 I for one have never seen three glass sections included in a tank kit before, so that alone is a big plus, but GeekVape also threw in a total of three drip tips and more o-rings that you could ever use, so as far as contents go, this is probably as good a deal as you can get. 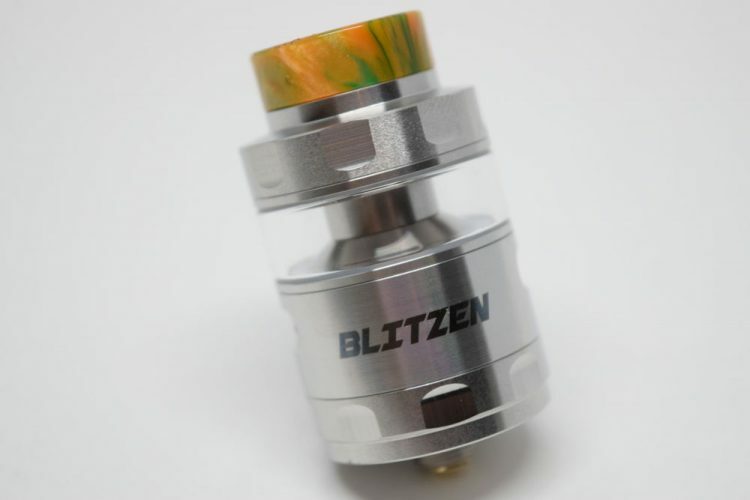 The Blitzen RTA is made primarily of stainless steel and glass. It’s 36mm tall, from the bottom to the tip of the drip tip, and measures 24mm in diameter. Actually, that’s the diameter of the base, as the tank itself is actually 25mm. But if your mod only fits 24mm atomizers without overhang, the Blitzen should look fine. 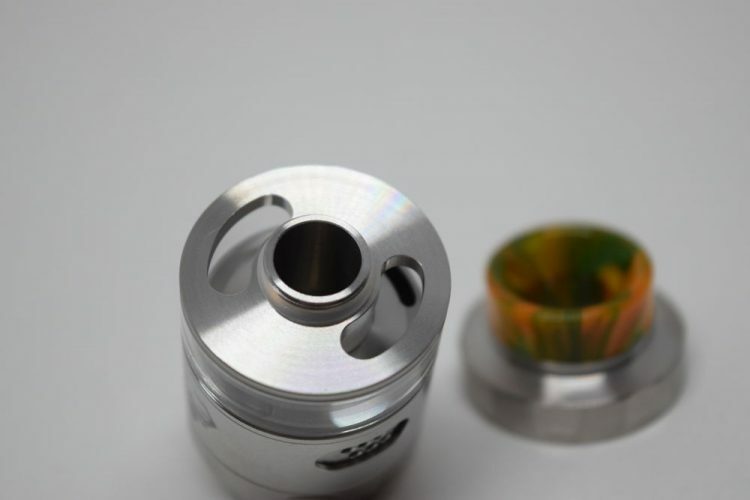 One of the most striking design features of the Blitzen RTA is the 810 resin drip tip. 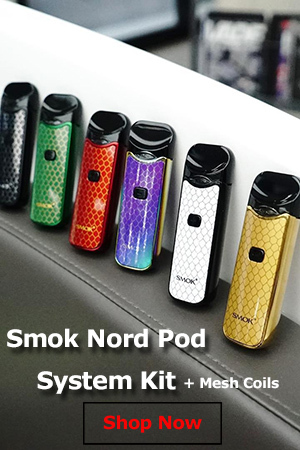 It comes in a variety of color combinations, so if you have resin mods like a VooPoo Drag or an Eleaf iStick PICO, you can match it with those for a really cool look. 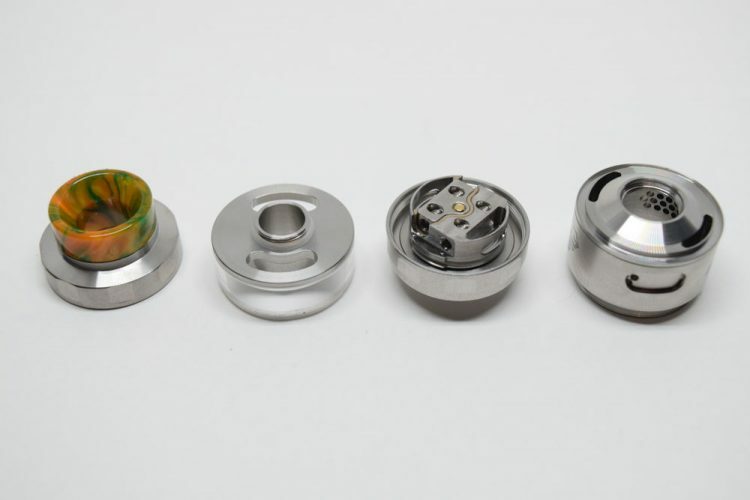 But the tank also comes with two other drip tips, as well as a 510 adapter so you can pretty much pair it with any drip tip. The top cap has some fine knurling to give you better grip when you need to refill the tank. The two fill-ports underneath are massive, so you can use virtually any type of bottle or dropper when refilling. One thing you’ll probably notice right away is that the fill-port plate is very thin, so there’s really nothing to grab when you’re trying to unscrew it from the atomization chamber below. Luckily, GeekVape includes a metal tool that goes into the two fill-ports, allowing you to easily unscrew it. In case you lose it, a small pair of pliers works too. 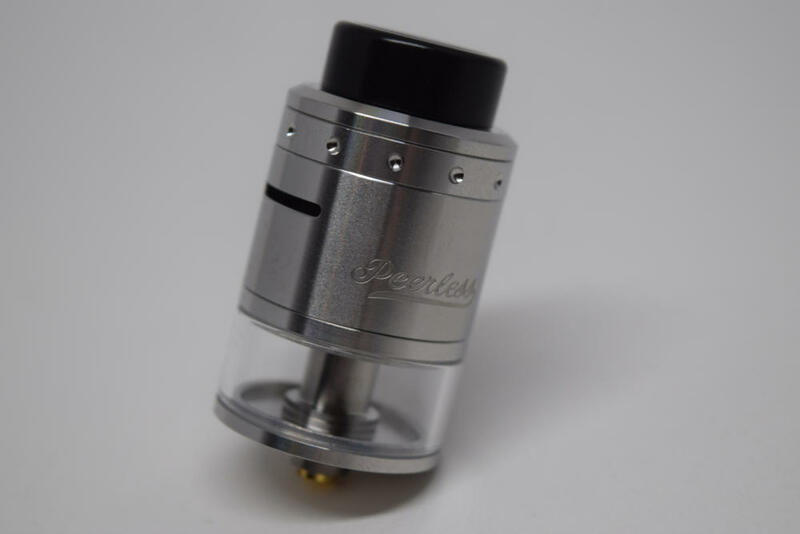 The glass section is surprisingly small for such an advanced RTA, and if you plan on using a low, dual-coil build, you’re probably going to be refilling it very often. But if 2ml capacity isn’t enough, you can always switch to the included bubble glass section, which increases juice capacity to 5ml. 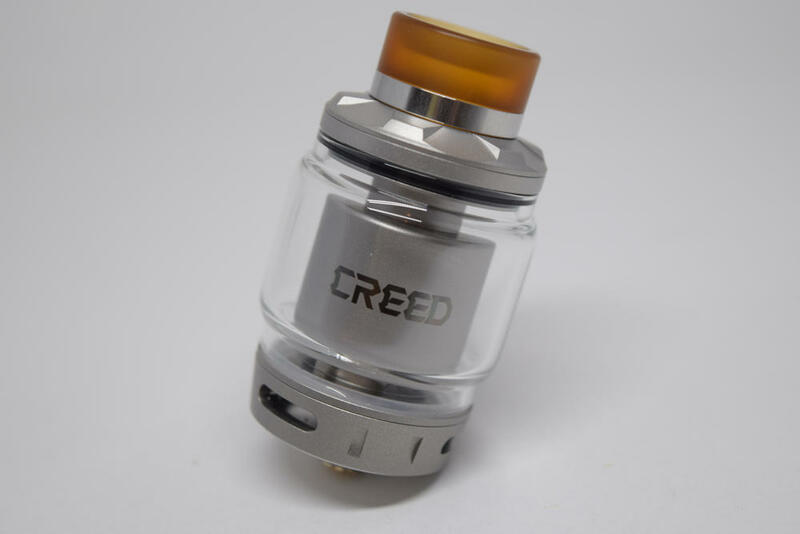 I think the tank looks much better with the 2ml glass section, to be honest, not to mention that the bubble tank is much more prone to cracking, because it extends out from the rest of the tank, so it is the first to make contact if you happen to drop your mod. On the flipside, those 3 extra millilitres do come in handy when you’re on the go. 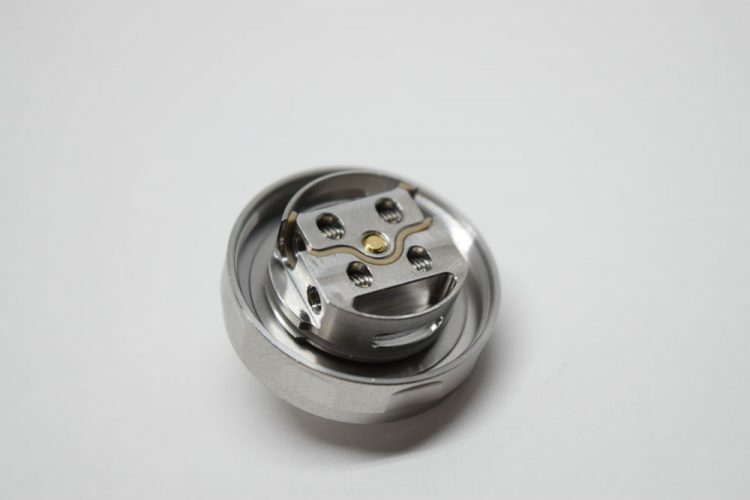 On the outside, the barrel, or the main section of the RTA, features a large, adjustable airflow ring that you can use to open and close two large side-airflow slots that look very similar to those on the Steam Crave Aromamizer Supreme V2. However, this section is a lot more complex than meets the eye. 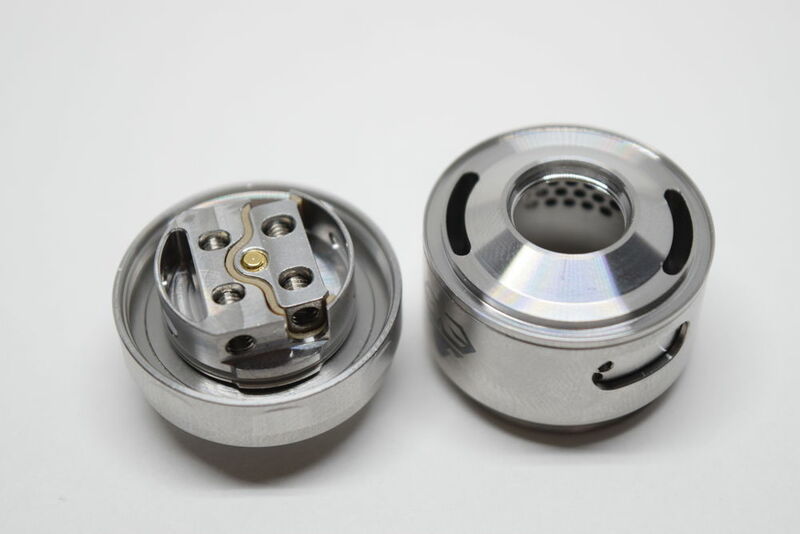 Between the outer wall and the atomization chamber inside are the juice channels that guide the e-liquid from the tank above down to the cotton wicks on the base. The juice goes into two large juice slots at the bottom of the reservoir and travels all the way to the bottom through these channels. The base has the same type of knurling as the top cap, making it easy to grip and unscrew when you need to access the build deck inside. Last, but not least, the 510 pin is gold plated and adjustable. It protrudes quite a bit by default, but I don’t recommend using it on a hybrid mod. In fact, I don’t recommend using hybrids at all, those things are dangerous. 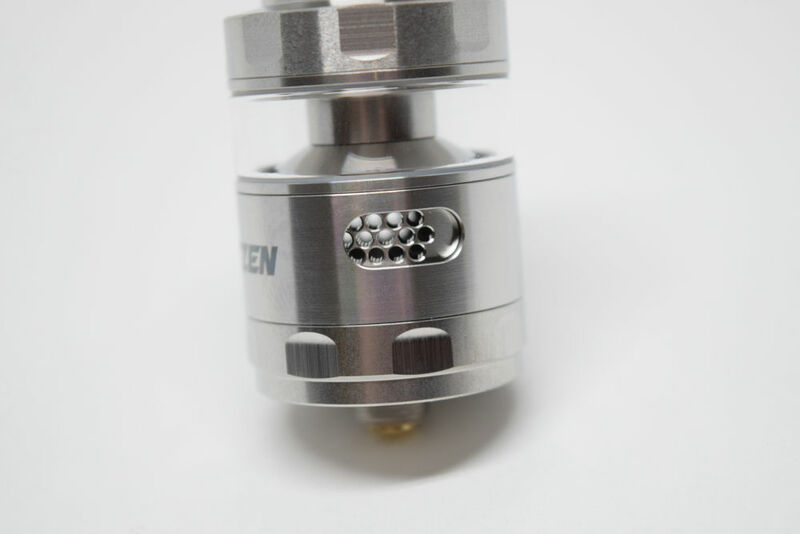 The Blitzen RTA features a postless build deck with about 18mm of space to work with. That’s more than enough for just about any type of coils, and mounting them is a piece of cake. Just stick the leads into the four slots, tighten the screws and you’re done. 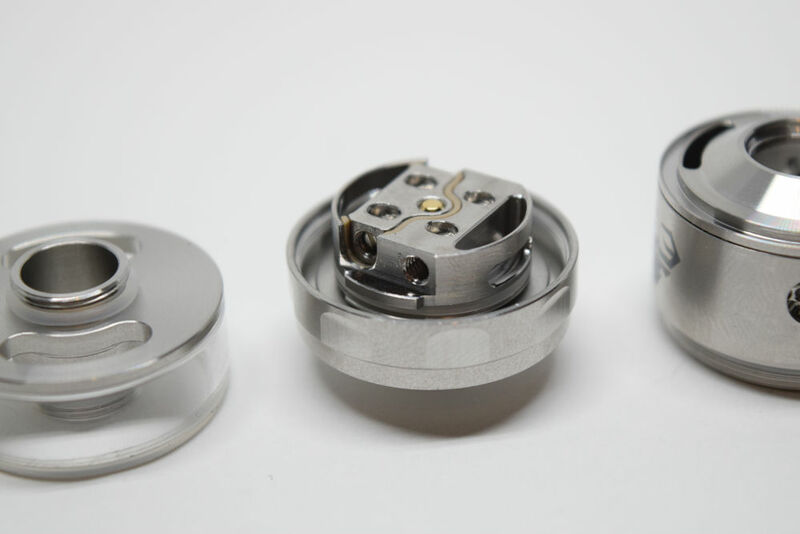 You don’t even have to worry about aligning the coils with the airflow slots, because the tank does that for you. One thing worth mentioning is that the build deck is fused to the base, which I for one think is kind of convenient, as you no longer have to worry about the deck threading getting stuck to the atomization chamber. When you unscrew the base of the tank, the deck comes off too. First thing you need to do is take the Blitzen RTA apart and give all the components a nice hot bath. I generally clean them under running hot water to make sure I remove any leftover machining oil, but you can also leave them in a bowl of hot water a few minutes and just give them a quick rinse. You can use some paper napkins to dry all the parts, before getting started with the coils. As I mentioned above, mounting the coils on the Blitzen’s postless deck is about as easy as it gets. The only important thing you need to pay attention to is insetting a lead in the positive post, and the other in the negative one. They are clearly separated by peak insulator, so you shouldn’t have any problems with that. Just take your coils and insert them into two of the deck slots. The leads will likely be too long, so you’ll need to cut them down to size. Make sure they don’t stick out too much, but also ensure that the coils themselves don’t touch the bottom of the deck. Once you’re happy with the size, tighten the screws on the side of the deck and make sure that they are heating up properly. 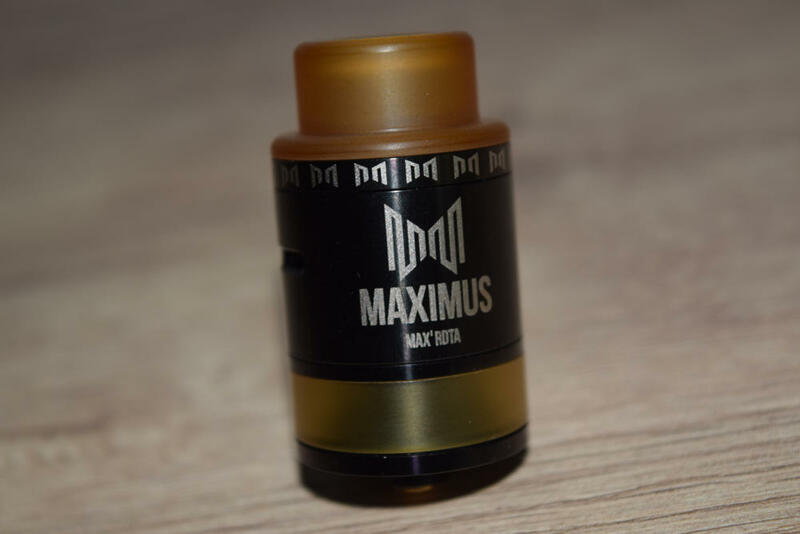 As with any RTA or RDTA, wicking is extremely important. The Blitzen features generously-sized wick slots, but you don’t want to cram too much cotton in them, because that will make it harder for the e-liquid to reach the coils. Ideally, you want to cut the wicks just long enough that they reach the bottom of the wick slots and cover the juice holes completely. I always thin my wicks a bit, though, so that the e-liquid can reach the coils easier. Wicking is something you just learn through trial and error, so even if you screw up the first time, don’t be discouraged. If you get dry hits, try thinning the cotton more, and if the juice floods the atomization chamber, make the cotton a bit fluffier. You’ll get the hang of it eventually. Once you’re done with the wicking, pour some juice over your cotton, but don’t overdo it. I made that mistake and got a nasty spray of hot juice spit back into my mouth. Luckily, it went away after a 5 or 6 draws, but you can avoid this issue by priming your wicks conservatively. Anyway, once you’re done with that, place the stainless steel over the base and turn it until you feel something fall into place. The base features a couple of inlets that have to align with two notches on the barrel before you can screw them together. This way, the coils are always aligned with the airflow slots on the side of the tank. So you don’t have to worry about aligning them, the tank does it for you. You are now ready to screw the base to the barrel. But wait, it doesn’t work. No matter how hard you try, you can’t turn the barrel one millimetre. So what’s happening. 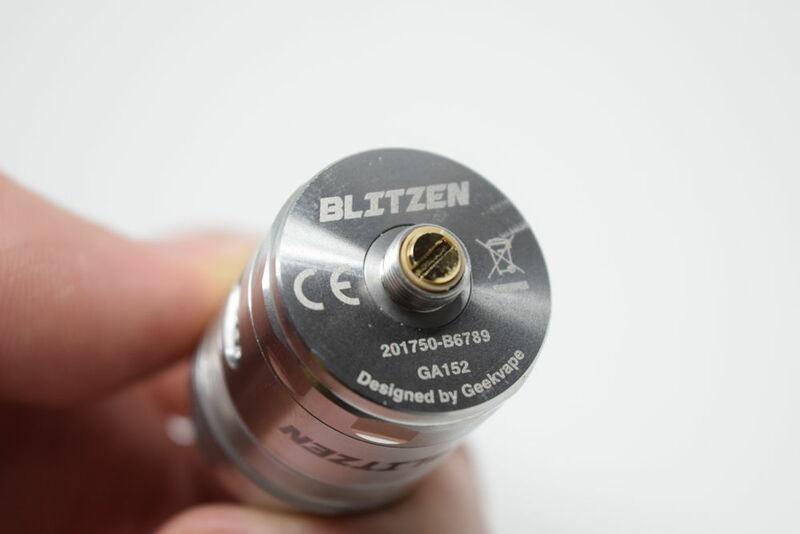 Well, here’s the weird part about the Blitzen RTA – you can’t screw the barrel onto the base, if the latter is already mounted on a mod or a coil testing rig. Basically, it the tank’s 510 pin is attached to something, you can’t attach the rest of the tank to it. Well, you kind of can, but instead of turning the barrel, you have to turn the base itself clockwise. It’s weird. The easiest way to do things is unscrew the base from whatever you have it attached to and then screw it on to the stainless steel barrel. The threads should feel buttery smooth this way. Now fill the tank with juice and vape. GeekVape made some really bold claims about the Blitzen RTA, calling it the ultimate RTA, and boasting about how it can both chug the vapor and deliver excellent flavor. Most of the time, this sort of presentation is just marketing, but in this particular case, it’s the truth. The GeekVape Blitzen is quite simply the best tank I’ve used in a long time. That includes RTAs, RDTAs, sub-ohm tanks, or whatever else kind of tank there is. It just blew me away. The vapor production is great, especially with those two airflow slots wide open, but the flavor you get from this thing is fantastic. I thought the Aromamizer Supreme was good, but the Blitzen has it beat. To be honest, I can’t think of any other tank I’ve tried in recent months that even comes close to the Blitzen in terms of flavor. I can’t tell you exactly what makes this such an amazing flavor tank – it could be the design of the atomization chamber, or the fact that the coils are always perfectly aligned with the airflow slots – but what I can say is that the Blitzen is so good that it can make a mediocre juice taste great. I’m currently vaping Dough Cream, a decent sugar cookie type vape most of the time, but right now it’s awesome. 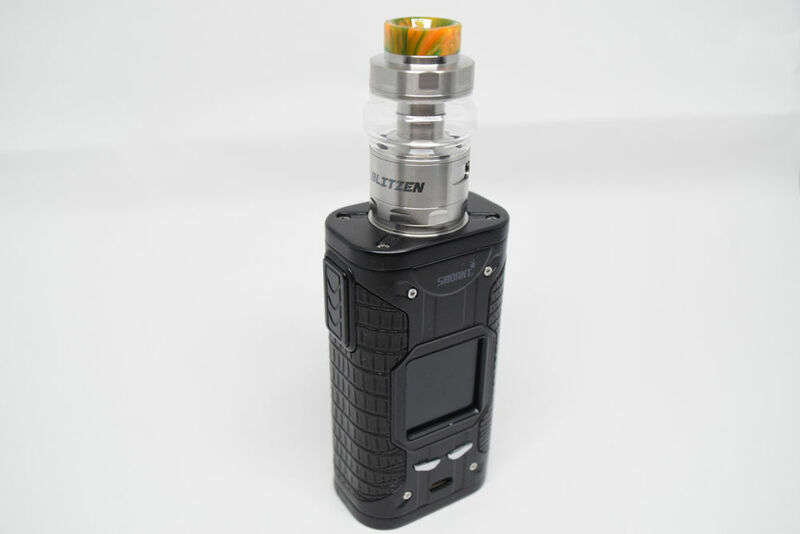 Since the GeekVape Blitzen has no bottom airflow holes, the risk of juice leaking all over your mod is greatly diminished. That said, you should always close the airflow slots when refilling the tank, to prevent juice from flooding the atomization chamber and later leaking through the airflow slots when you tilt your mod. I’ve never had any leaking issues with mine, but you should always be careful when refilling RTAs. In terms of performance, I give the Blitzen a 5.5 out of 5. I just can’t put into words how much I enjoy using it. Well, GeekVape have hit another home-run with the new Blitzen RTA. It can chug the flavor and deliver fantastic flavor, just like they said it would, and is very simple to use. Not to mention that it comes with a total of three glass sections, three drip tips and a bunch of spare parts. If you’re looking for an all-around great tank with an emphasis on flavor, I really can’t think of a better option than this. 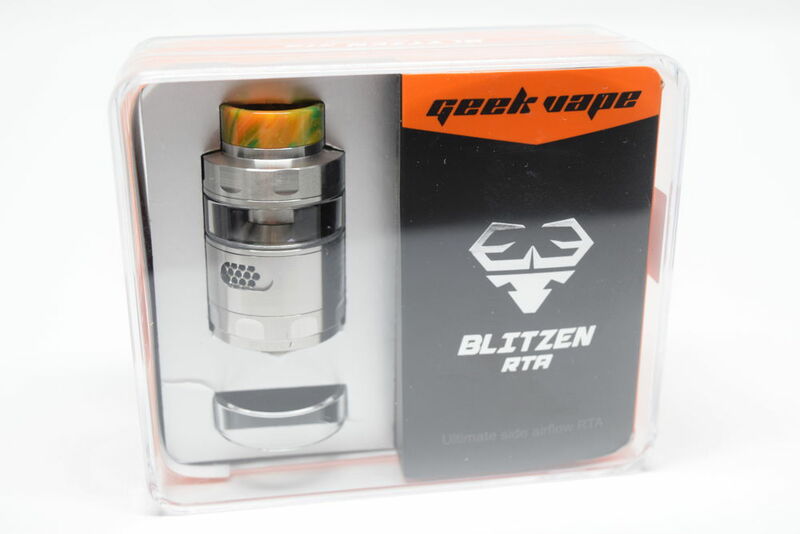 Vapesourcing currently has the GeekVape Blitzen RTA in stock. Did you observe whole tail with 510 thread comes out and in around 1mm in the bottom of mizer when you push-pull positive pin? And one more thing – why we need post less deck when coil tails must be around 4-5-6mm long to align coils to the airflow holes. Follow longer cotton wick…that is premise to dry hits along with hot legs of coil. 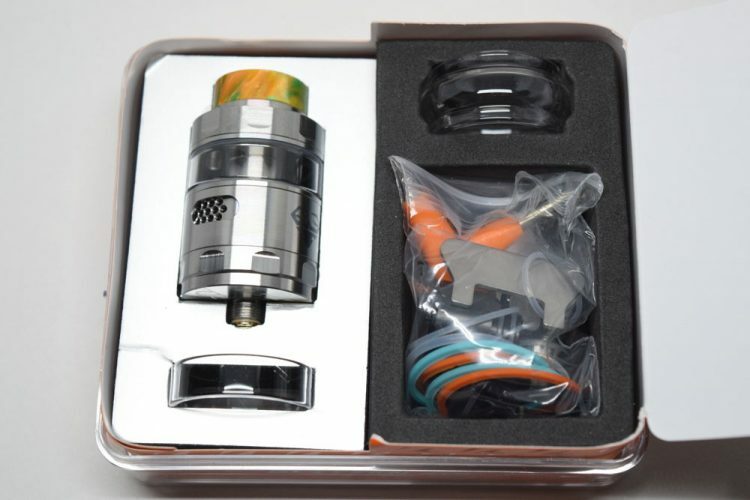 What an excellent review of this RTA. I’m hoping to get answers about my Blitzen’s leaking problem. I’ve only had this atomizer for a few days and I was hoping to fix the problem ASAP. One of my friends thought that the coil build was too high and far from the base, but I just thought that it should’ve been evenly placed parallel to the airflow. And I think my wicking’s quite good, but still, the leak doesn’t stop. And I noticed that everytime I drip at the fill port, it easily goes down the deck and surely enough, a few moments later, the e-liquid goes out the airflows. Any opinions about that would surely help me. Would love to hear from you soon. Thanks!! Yeah, that really sounds like the wicking isn’t good. Are you sure that both wicking slots (on both sides of the deck) are blocked off? If juice leaks through the air holes when you’re filling the tank, them the wicking really isn’t doing a good job of insulating the atomization room. I’m not saying that you should stuff the wicking slots with cotton, but do make sure that the wick actually covers the openings. Hope this helps. I must say I have zero problems with mine. Coils are combined 0.13 short stacked and using Bacon Cotton Prime cotton. The flavor just keeps on coming and coming. Hits are perfect with the VooPoo DRAG. 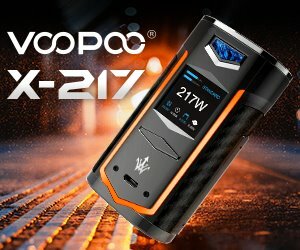 I have many SMOK and Vandy Vape Tanks but this just kills them all in competition. I as well keep having the same problem as Sean, ive wicked it so many different times, so many different ways, ive also had people who have built for years have this same problem. it only leaks out like 1/2 the tank too, and i find that odd. after 1/2 the tank leaks through the air ports itll hit super nice, then i dont get many hits due to having to fill my tank yet again, the next time i need to fill my tank, i will see what happens when i only fill it 1/2 way. I’m getting so irritated with this RTA it’s unreal.